Why Is Heated Dry Not Working on a Maytag Dishwasher? Maytag is a brand of appliances sold by the Whirlpool Corporation. It produces both portable and built-in dishwashers, which feature different washing and drying options. If your dishes aren’t drying properly, troubleshoot the issue since you can often fix this problem. Always disconnect the dishwasher from the power source before attempting any major repair on it. If your Maytag dishwasher is not drying properly, see if you selected a heated drying cycle. Do not use an air drying cycle. Wash your dishes uses a “High Temp Wash” cycle to assist with the drying process. Use a rinse aid. Do not overload the dishwasher as this affects the drying process. Certain dishes including plasticware and Teflon products never completely dry. Use a towel to dry these items. 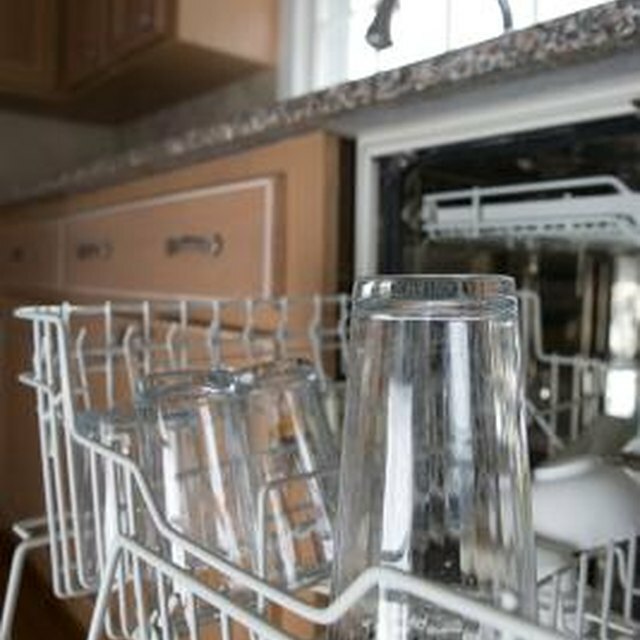 Always unload the bottom rack first to prevent water from the top rack from falling on the dishwasher. If your water is too cold, then your dishes won’t dry properly. Maytag recommends that you water temperature be between 120 and 140 degrees Fahrenheit. Test your water temperature by running the hot water in your kitchen faucet for about 2 minutes. Stick a thermometer under the faucet. If the water temperature is too cold, increase the temperature setting on your hot water heater. Check the heating element, which is located on the base of the tub. If the element is broken or burnt out, order a new part from a Maytag parts dealer. The thermostat is responsible for control the drying and water temperature inside your Maytag dishwasher. If the thermostat is broken, then the heating cycle may not start. Test the thermostat by running a short washing cycle on the highest possible temperature. Open the door of the dishwasher, and see if the water is hot. If it’s not, you must replace the thermostat since it’s difficult to repair. Order a new one from a parts supplier. If your Maytag dishwasher is not drying your dishes, check the drying fan, which is located in the main housing of the dishwasher. This fan is responsible for blowing warm air around your dishes. If it’s not working properly, then your dishes won’t completely dry. Disconnect the dishwasher from the power source, and remove the main access panel. Examine the fan, and clean it if it’s clogged with debris. If it’s clean, see if any of the fan blades are broken. Check the fan motor, and see if it’s corroded or won’t turn. Replace the entire fan since it’s difficult to fix individual components. AcmeHowTo.com: How Does a Dishwasher Work? How Do you Clean Cloudy Glass Dishes?